Top Senate Republicans plan to release a health care bill Thursday that would do away with the individual mandate, Obamacare's taxes and cut back the expansion of Medicaid, although at a slower rate than the House-passed bill, CBS News' John Nolen reports. The Senate's proposal for dismantling President Obama's signature health care law would also keep more protections for people with preexisting conditions than the House bill did. The Senate bill will also provide tax credits based on income, providing more money to lower income recipients to help them buy insurance. The House bill tied its tax credits to age, which the nonpartisan Congressional Budget Office said would boost out-of-pocket costs to many lower earners. Starting in 2020, the Senate version would begin shifting increasing amounts of tax credits away from higher earners, making more funds available to lower-income recipients, some of the officials said, the Associated Press reports. 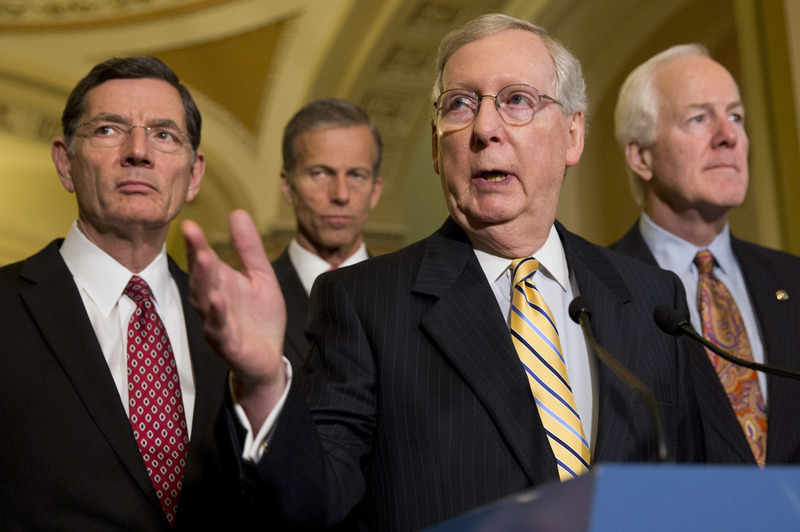 The Senate bill would also eliminate federal funding for Planned Parenthood. Many Republicans have long fought that organization because it provides abortions. Senate GOP leaders hope to have the Congressional Budget Office (CBO) score by Monday in order to hold a vote by the end of next week. On Wednesday night White House staff met with Senate Republican staffers on Capitol Hill to review the bill, Nolen reports. White House staff and Senate GOP staff met frequently during the crafting of the bill. Departing from the House-approved version of the legislation - which President Trump privately called "mean" last week - the Senate plan would drop the House bill's waivers allowing states to let insurers boost premiums on some people with pre-existing conditions. It would also largely retain the subsidies Obama provided to help millions buy insurance, which are pegged mostly to people's incomes and the premiums they pay. Senate Majority Leader Mitch McConnell planned to release the measure Thursday morning. Some of its provisions were described by people on condition of anonymity because they were not authorized to discuss them publicly. "We believe we can do better than the Obamacare status quo, and we fully intend to do so," said McConnell, R-Kentucky. McConnell was unveiling his plan even as GOP senators from across the party's political spectrum complained about the package and the secretive, behind-closed-doors meetings he used to draft a measure reshaping the country's medical system, which comprises one-sixth of the U.S. economy. Facing unanimous Democratic opposition, Republicans can suffer defections by no more than two of their 52 senators and still push the measure through the Senate. Enough have voiced concerns to make clear that McConnell and other leaders have work to do before passage is assured. GOP Senate leaders were eager to get a seal of approval from Mr. Trump, who had urged them to produce a bill more "generous" than the House's. "They seem to be enthusiastic about what we're producing tomorrow," No. 2 Senate GOP leader John Cornyn of Texas told reporters. "It's going to be important to get the president's support to get us across the finish line." At a campaign-style rally Wednesday in Cedar Rapids, Iowa, Mr. Trump said he urged Senate Republicans to add more money to their health care plan because he wants a plan with "heart." He also suggested he would be willing to change the bill Republicans are crafting if Democrats would come onboard, saying, "A few votes from the Democrats, it could be so easy" and "so beautiful." Scrapping Obama's 2010 statute is a top priority of the president and the GOP, but internal divisions have slowed its progress through the Republican-controlled Congress. Democrats say GOP characterizations of Obama's law as failing are wrong, and say the Republican effort would boot millions off coverage and leave others facing higher out-of-pocket costs. The sources said, according to the AP, that in some instances, the documents McConnell planned to release might suggest optional approaches for issues that remain in dispute among Republicans. That could include the number of years the bill would take to phase out the extra money Obama provided to expand the federal-state Medicaid program for the poor and disabled to millions of additional low earners. The House-passed bill would halt the extra funds for new beneficiaries in three years, a suggestion McConnell has offered. But Republicans from states that expanded Medicaid, like Ohio's Rob Portman, want to extend that to seven years. The Senate proposal would also impose annual limits on the federal Medicaid funds that would go to each state, which would tighten even further by the mid-2020s. Unlimited federal dollars now flow to each state for the program, covering all eligible beneficiaries and services. The Senate would end the tax penalties Obama's law created for people not buying insurance and larger employers not offering coverage to workers. The so-called individual mandate - aimed at keeping insurance markets solvent by prompting younger, healthier people to buy policies - has long been one of the GOP's favorite targets. To help pay for its expanded coverage to around 20 million people, Obama's law increased taxes on higher income people, medical industry companies and others, totaling around $1 trillion over a decade. Like the House bill, the Senate plan would repeal or delay many of those tax boosts. The House waiver allowing higher premiums for some people with pre-existing serious illnesses was added shortly before that chamber approved its bill last month and helped attract conservative support. It has come under widespread criticism from Democrats and helped prompt some moderate House Republicans to vote against the measure. Earlier Wednesday, conservative Sen. Rand Paul, R-Ky., seemed skeptical that McConnell's package would go far enough in dismantling Obama's law, a concern shared by other congressional conservatives. "I'm still hoping we reach impasse and we go back to the idea we started with, which is repeal Obamacare," Paul said. "I'm open to keeping some of Obamacare. I'm not open to Obamacare lite." Moderate Sen. Susan Collins, R-Maine, said she had "no idea" if she'd back the legislation until she sees the language. She said an analysis of the bill by the nonpartisan Congressional Budget Office, expected Monday, would be "extremely important to me because I want to know the impact on coverage and on cost."